This Saturday, YA Panel at the Blue Bunny! 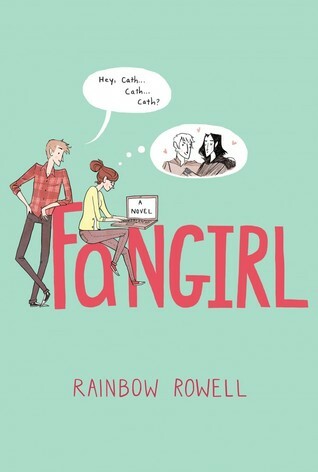 Upcoming Event: YA Panel at Porter Square Books on July 17th! Join YA authors Susan Adrian, Jen Brooks, Annie Cardi, MarcyKate Connolly, Trisha Leaver, Rachel Shane for a panel discussion, moderated by YA author Mackenzie Lee, as they talk about reading, writing, and the debut experience. 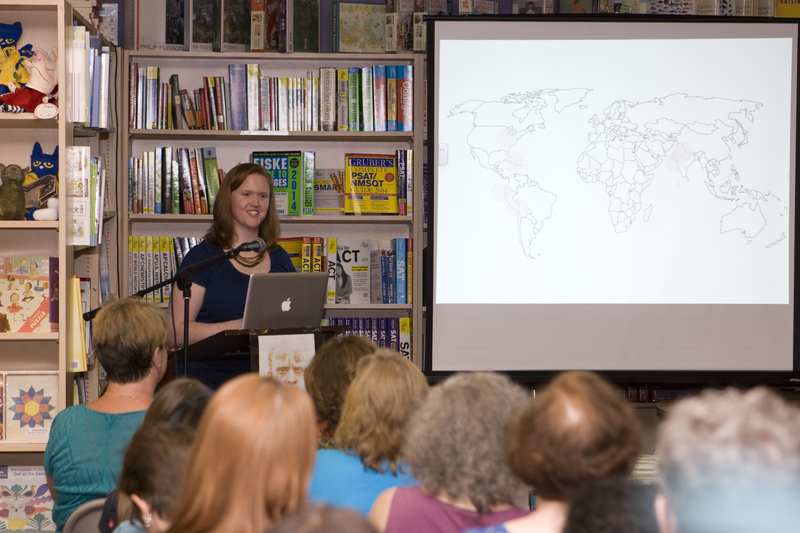 Porter Square Books is where I had the launch party for The Chance You Won’t Return and I’m so excited to be back there with a bunch of other lovely debut authors. Mark your calendars! 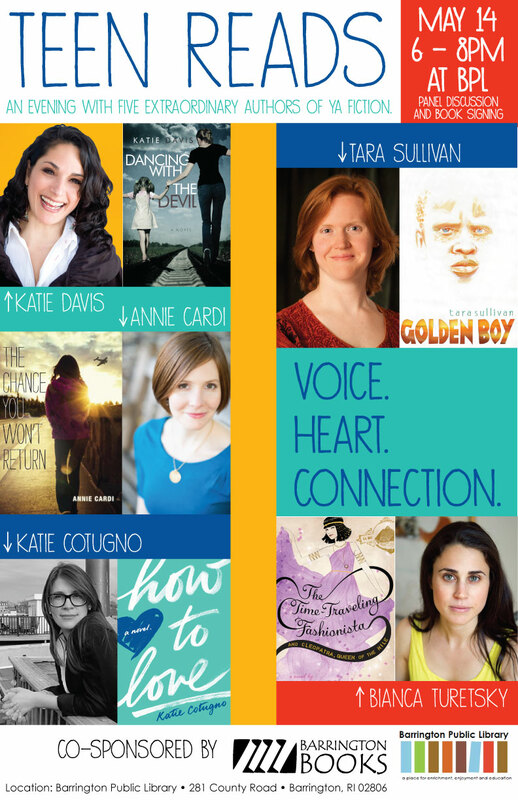 Upcoming Event: YA Panel at the Blue Bunny on March 14th! Saturday March 14th, 3 p.m.
Join YA authors Cara Bertrand, Kim Harrington, Annie Cardi, AC Gaughen, and Gina Damico for a panel discussion, Q&A, and some tasty treats. I’m so excited to be part of such a great group. Plus, it’s March 14th, aka 3/14, aka Pi Day, so there may even be celebratory pie. What more could you want? And since it’s an event at the Blue Bunny, that’s an excuse to share a bunny gif, right? Come Find Me at Buttonwood Books Tomorrow Night! Tomorrow I’ll be at Buttonwood Books in Cohasset, MA (just outside of Boston) for a panel and signing with my fellow 2014 debut YA author the lovely Skylar Dorset! 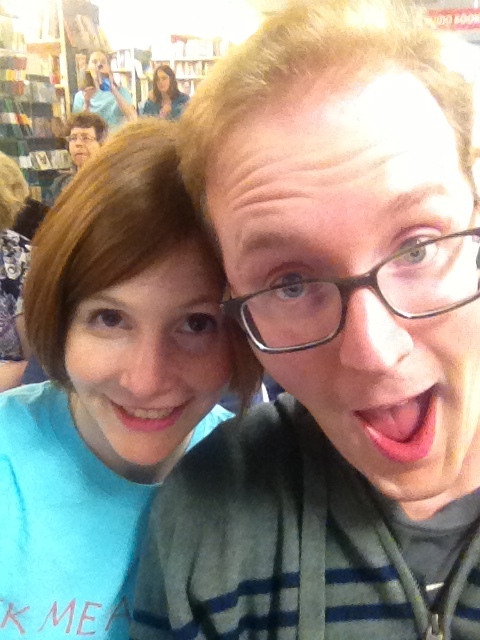 Come for the discussion about YA writing, stay for the signing and smiles. The weather is supposed to be kind of gross, but hopefully by 7pm things will have calmed down. And what better way to spend a rainy day than by hitting up a local bookstore? 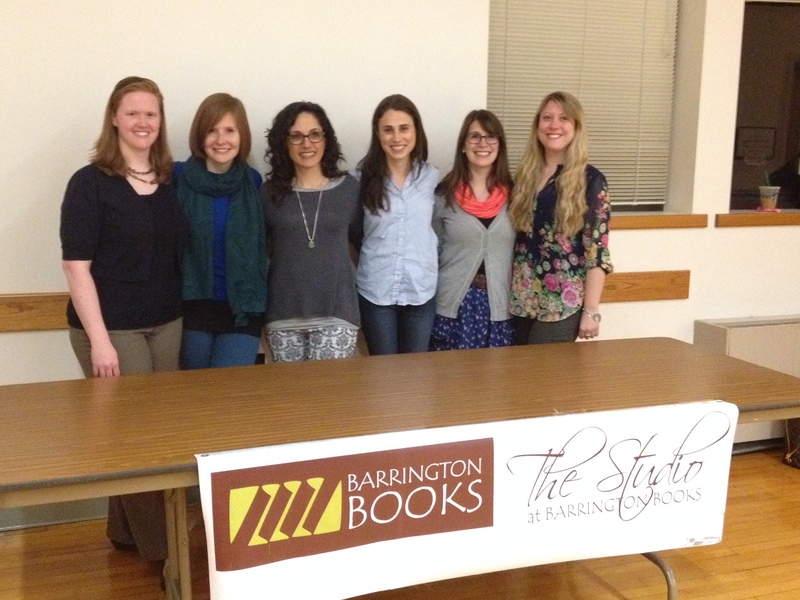 Last night I was part of my first YA author panel, hosted by the Barrington Bookstore and the Barrington Public Library. Having grown up in Rhode Island, this was a really fun and exciting opportunity for me. On the panel with me were Tara Sullivan, author of Golden Boy, Katie Cotugno, author of How to Love, Bianca Turetsky, author of The Time-Traveling Fashionista series, and Katie Davis, author of Dancing with the Devil. Our moderator was the wonderful Alyisha Foley, librarian and blogger and kidlit enthusiast. Alyisha had great questions, and I loved hearing my fellow panelists talk about their own experiences writing books for teen readers and about their own young reading experiences. All of us agreeing that middle/high school are so freaking hard and basically when you need books the most. Also agreeing that sometimes spoken communication is hard–long live the text/email! Talking about what why flawed characters are compelling and real. Bianca Turetsky’s shoutout to the Baby-Sitters’ Club. Getting to sign The Chance You Won’t Return for RI family and friends, including the parents of some of my friends from high school. Thanks so much to Anika Denise and Barrington Books for organizing such a great panel, to the Barrington Library for letting us use their wonderful space, and to everyone who came out on a Wednesday night to hear us talk about the awesomeness of YA! Thanks so much to Barrington Books for organizing this event and more as part of Children’s Book Week. 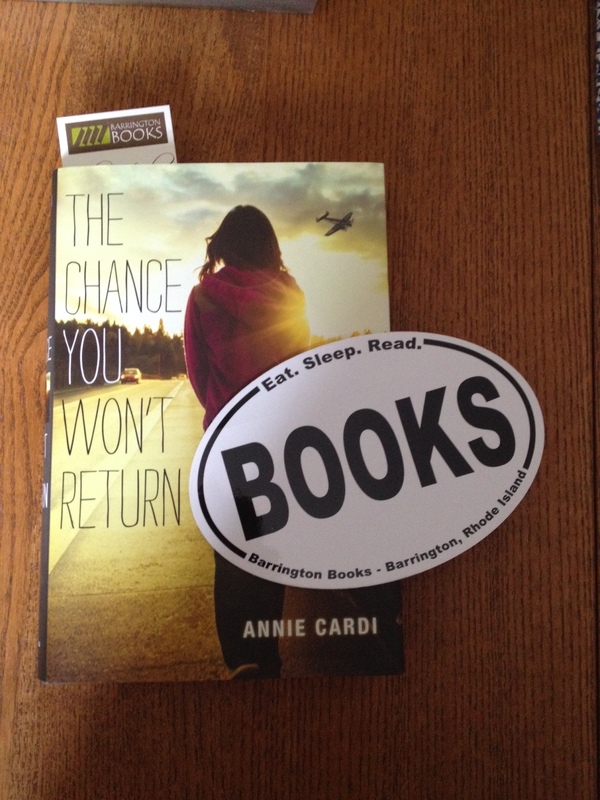 If you’re in the RI area, make sure to check out this fantastic local bookstore. And come to the panel at the Barrington Library tonight! 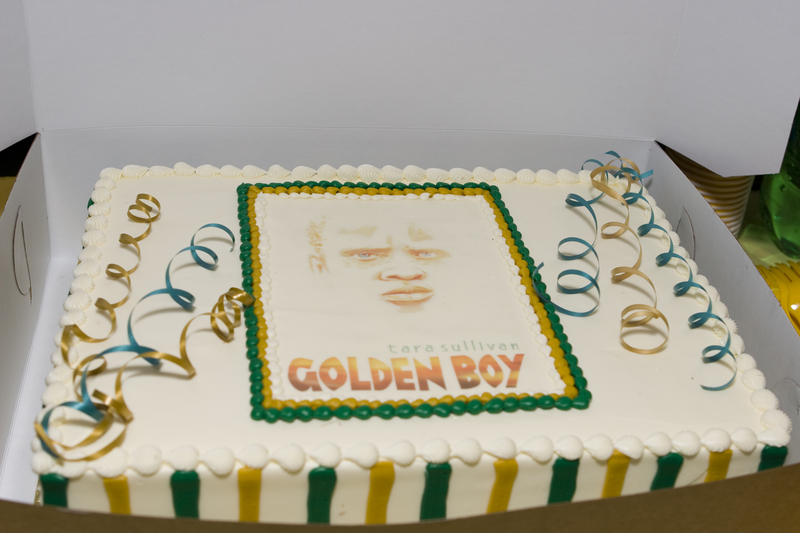 It’s not every Thursday night you get to wear an awesome t-shirt, see pictures of African wildlife, learn about Albinism activism, eat cake, and hear a reading of a debut novelist’s awesome book. 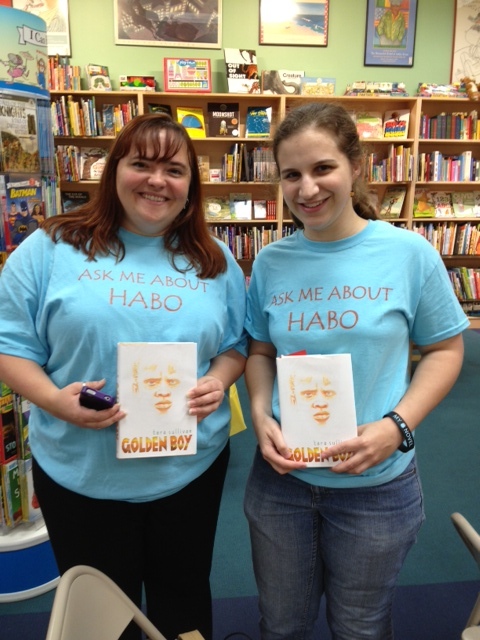 Fortunately, last Thursday was that kind of night, thanks to the Golden Boy launch party at Porter Square Books. Hearing Tara talk about her own childhood growing up all over the world and dealing with the accompanying social and medical issues (like almost losing her sight from the UV rays while living in Bolivia). I love hearing about author’s backgrounds and connecting their experiences to their work. Seeing photos from Tara’s Golden Boy research trip to Tanzania. She showed us what would have been the map of Habo’s group and photos of the real life places that inspired his journey. Tara reading aloud from Golden Boy and hearing the crowd react to the lovely writing. So excited for people to read this one! 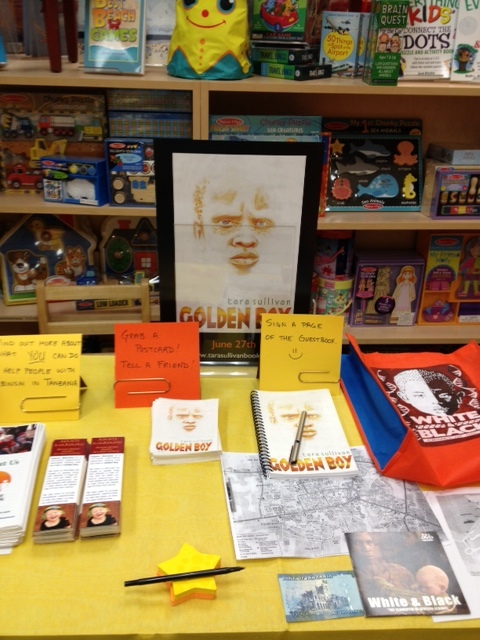 The swag table, complete with bookmarks, info on how to help people with albinism, a Golden Boy guest book, and real African carvings like the ones Kweli makes in the book. I had a blast and am psyched for lots of friends’ future launch parties. 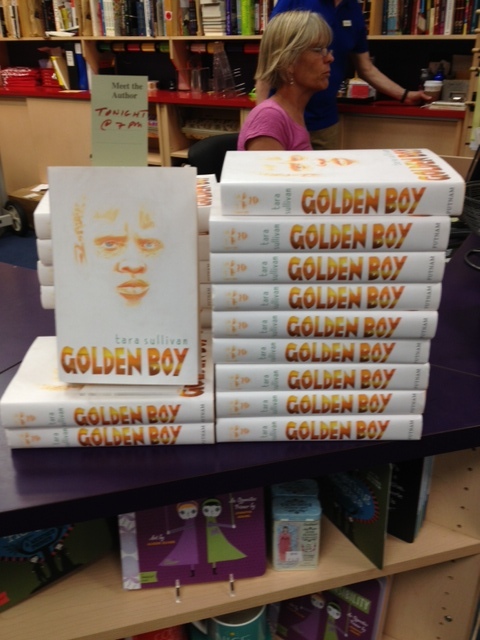 Now go read Golden Boy! Even though last week I had to stop hating Amy, I can still get on board with loathing some of these characters who are not technically villains but are still hate-worthy. How booksellers plan their inventory, aka returns are my new nightmare. And if you’re in tired of the BEA events, SLJ has some suggestions for more general New York fun. I want to see a yarn bomb! Virginia Woolf sounds pretty much like I thought she would, which makes me unreasonably happy. Thoughtful response to Maureen Johnson’s call for cover flips. Guys. 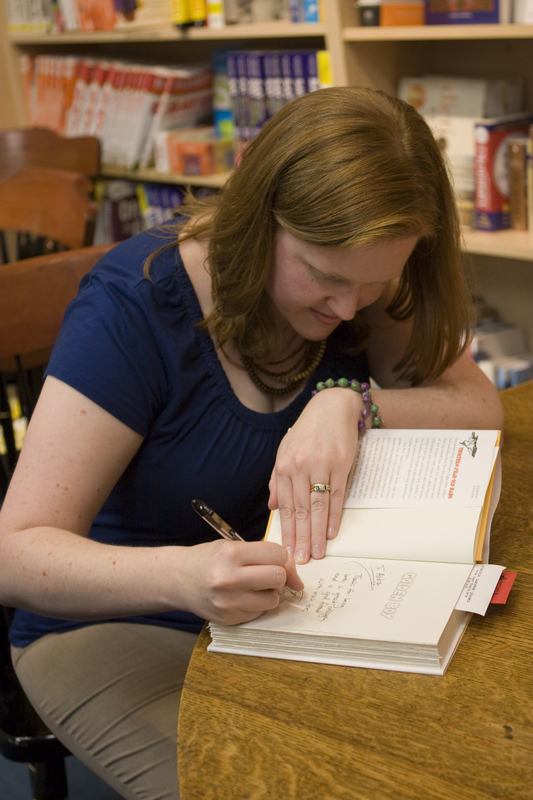 You can bid for first editions of novels with personal annotations from their authors. Like JK Rowling. GUYS.